The new rigid (and lockable) panniers feature a sleek clamshell design. They’re easy to load and unload and can be opened with one hand by a seated rider; a damping device allows the lids to open smoothly. The bags can also be removed in seconds with an internal quick-release mechanism, leaving behind barely visible mounting points. Combined pannier capacity is 25.5L. 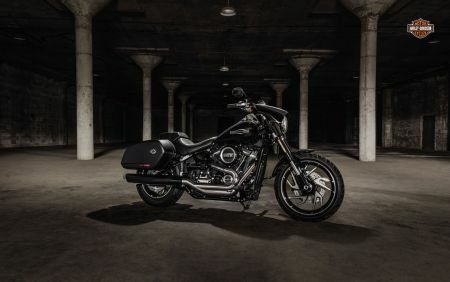 The Sport Glide also features the all-new Softail monoshock rear suspension with remote hydraulic spring preload adjustment, controlled via an exposed knob below the right-side cover. It’s thus easy to accommodate the weight of luggage or passenger while maintaining optimal suspension performance and steering geometry.